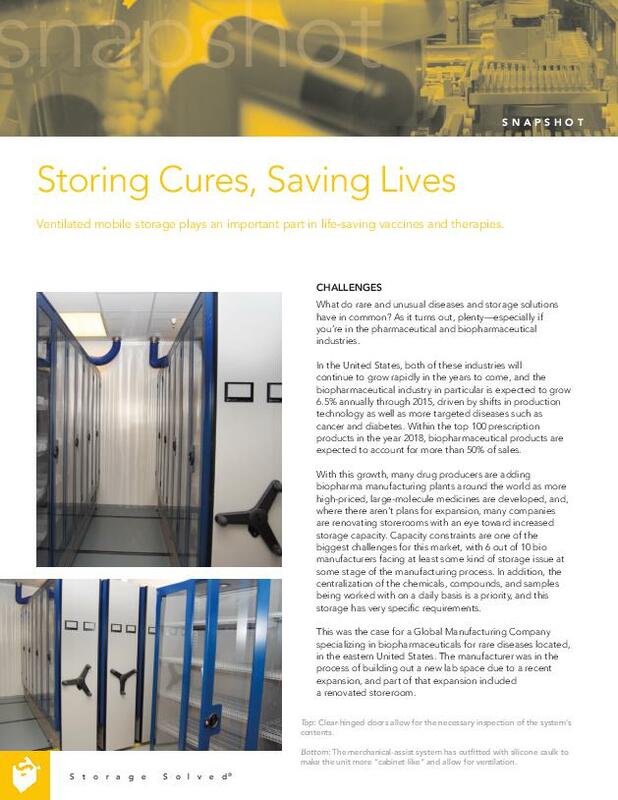 Controlled Room Temperature Storage for Biopharmaceutical Products and Vaccines. Climate controlled, organized and protected. Plus easy, fast access to your biopharmaceutical compounds and samples, right when your team needs it. The $74.3 billion US biopharmaceutical industry is expected to grow 6.5 percent annually through 2015, driven by dramatic shifts in production technology and more targeted diseases such as cancer and diabetes. With these changes, is your biopharma plant at capacity? Or do you need a better, safer way to store patent-pending product and limit capacity contraints at the same time? Store your chemicals safely and in a more efficient and controlled room temperature storage space with ActivRAC® mobile racking. Plus get faster, easier access to anything you need, right when you need it. Evaluating controlled room temperature storage? Reduce the space required to store life-saving vaccines and therapies with ActivRAC mobile racking for the biopharmaceutical industry now.